The U.S. government has condemned the crackdown. An American citizen and her husband, a U.S. lawful permanent resident, were arrested in Nicaragua on Sunday, their family and national police say, amid a violent crackdown on political opposition by President Daniel Ortega that has stretched for months now and claimed hundreds of lives. Marcela Martínez, 39, and Allan de Jesús Cordero Ocón, 40, were among a group of 38 people arrested and accused by the government of "instigative and provocative activity," participating in a public protest without permission and disturbing the peace. Eight of those detained were released on Sunday, and on Monday afternoon Martínez and Cordero Ocón were freed as well, although it's unclear why. But dozens of Nicaraguans remain in custody, with growing international condemnation of Ortega's government's severe response to the protests. 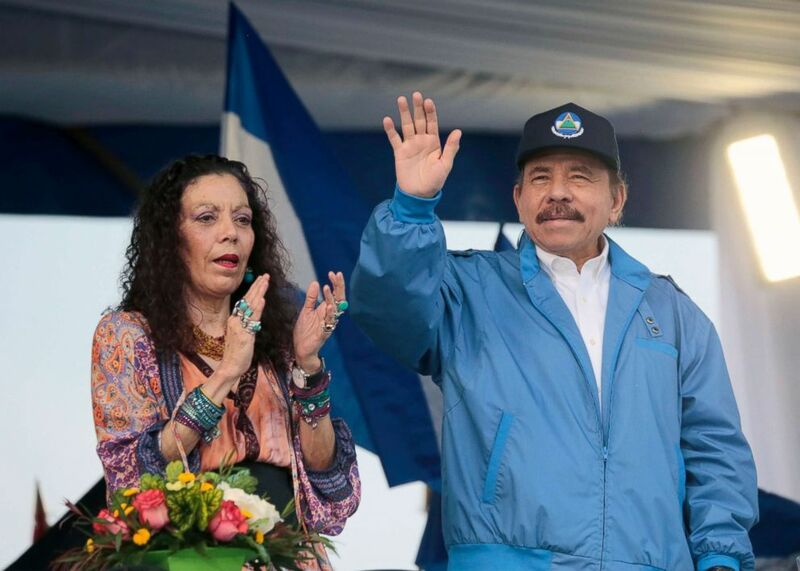 "The world must wake up and recognize that what President Daniel Ortega and his wife, Vice President Rosario Murillo, are doing to their own people is a crime against humanity. They have betrayed the trust of the Nicaraguan people as they crack down on democratic reform in a ruthless attempt to solidify their power," said Martínez's cousin Michael Hower in an email to ABC News before their release. (Inti Ocon/AFP/Getty Images) Nicaraguan President Daniel Ortega (R) waves to supporters, next to his wife and Vice President Rosario Murillo, during a march in honor of Salvadoran blessed Monsignor Oscar Arnulfo Romero, on the eve of his canonization, in Managua, Oct. 13, 2018. Nicaragua has been ruled for years now by Ortega, a leader of Nicaragua's left-wing Sandinista revolution that brought down the Somoza family dictatorship and took power in 1979. He ruled as president from 1984 to 1990 and was voted back into office in 2006. Since then, he's tightened his grip on power, including by abolishing term limits and restricting freedom of the press. In April, his government announced social security reforms that increased contributions and decreased benefits, sparking protests that soon expanded because of widespread discontent with Ortega's rule. Police and counter-protesters dispatched by Ortega clashed with demonstrators, according to human rights groups, leading to dozens of deaths. Six months later, more than 300 people have been killed, according to the Associated Press, with thousands more injured and opposition protests banned by Ortega. Thousands of Nicaraguans have fled the country, too, according to the non-profit Nicaraguan Center for Human Rights. 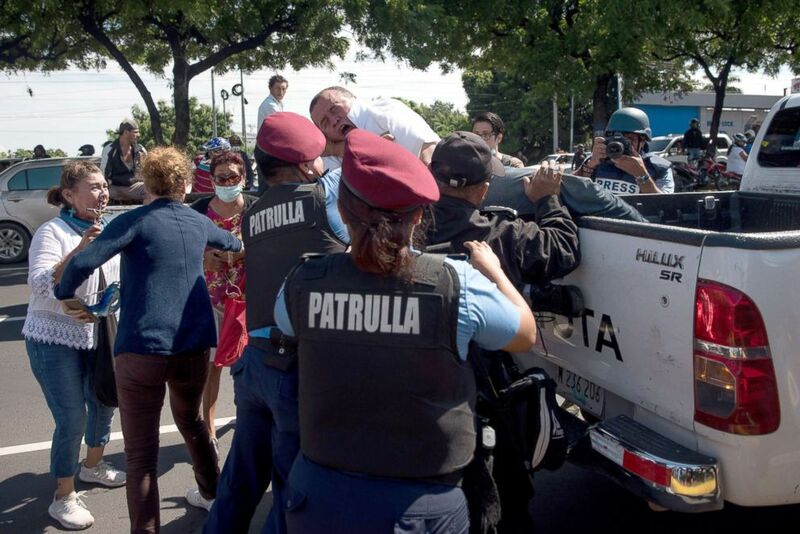 (Carlos Herrera/dpa/Newscom) Police arrest a man during a demonstration against the government, Oct. 14, 2018, in Managua, Nicaragua. But Martínez and Cordero Ocón stayed to stand "up for the very ideals of justice and freedom that America was founded on," Hower said. 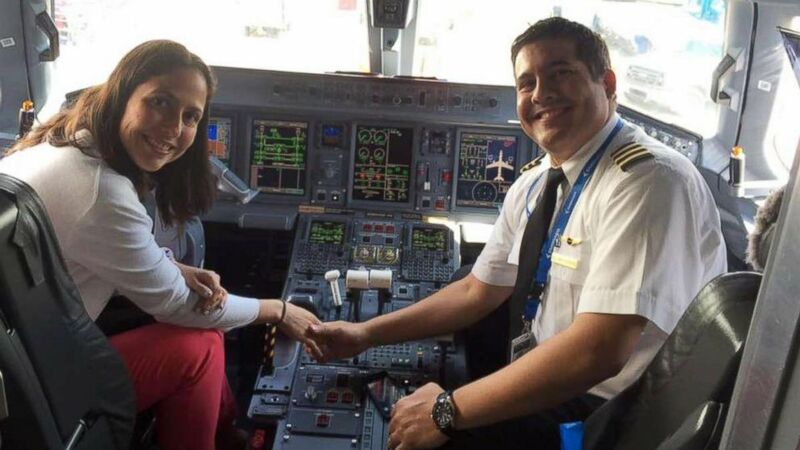 Martínez is a dentist, and Cordero Ocón is a pilot for SkyWest, flying frequently back and forth to the U.S. Cordero Ocón has a green card and is currently going through the naturalization process to become a U.S. citizen, according to Hower. They have two young daughters together, who are now in their grandmother's care. While they're based in Nicaragua's capital Managua, much of their family lives in the San Francisco area. "I visited them in Nicaragua last year, and recall asking them why they stay there (they have the means to leave), and they told me: This is home," Hower added. "I believe they are true heroes for standing up to oppression when they don't have to." (Michael Hower) Marcela Martinez, 39, and Allan de Jesus Cordero Ocon, 40, were arrested October 14 by Nicaraguan security forces amid an ongoing crackdown on opposition and protests against President Daniel Ortega. Allan de Jesus Cordero is a pilot for SkyWest. The State Department told ABC News it was "aware of reports of the arrest of U.S. citizens in Nicaragua" and "prepared to provide all appropriate consular services." An official would not comment on their specific case, citing privacy concerns. The Trump administration has taken some action to punish Ortega's government, sanctioning three Nicaraguan officials in July and restricting visas in June for national police officials, local officials, and a Ministry of Health official -- all of whom are accused of "directing or overseeing violence against others exercising their rights of peaceful assembly and freedom of expression," a U.S. official said. Those actions were meant to show "the U.S. will not stand by idly in the face of the abuses taking place in Nicaragua. ... We will expose and hold accountable those responsible," a senior official said in July, although there have been no new actions taken since then. A U.S. citizen was shot and killed on June 1 amid the protests. U.S. Ambassador Laura Dogu said at the time the death was "of great concern to our Embassy." The State Department's Travel Office advises American to reconsider travel to Nicaragua, citing "crime, civil unrest, limited healthcare availability, and arbitrary enforcement of laws."